Click on any picture or underlined link to view additional pictures. This 4,000 SF 1860 brick house was visited by Abraham Lincoln around the time of the civil war. The property had fallen into disrepair and was completely renovated. The work performed by Herman Construction Inc. included all administrative work, permits, providing shop drawings, proposals, cost estimates, approval of all subcontractors and crew, interfacing with building inspectors and the property owner’s representative. I assumed all responsibilities for the project from start to finish. Construction details included: Exterior features were restored to meet the Secretary of the Interior Standards for Rehabilitation including the windows, doors, railings, roofing, and other original architectural components. All systems were completely updated including: electric, plumbing, HVAC - geothermal heating and cooling, new kitchen, three new bathrooms, insulation, plaster work, masonry, custom cabinetry and built-in furniture, etc. Original plaster walls were restored and all the original heart pine floors and steps were screened and coated so as to leave the original patina. In part II of this job there was the design and construction of a 3,000 sq. ft. detached historically compatible two-story brick garage with octagonal office. 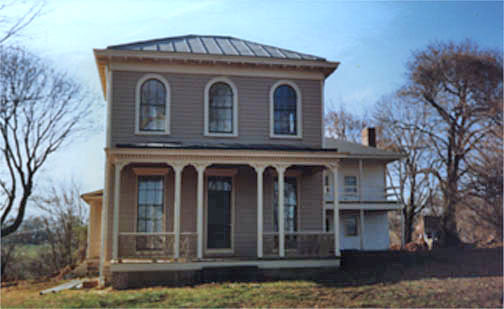 This house restoration was completed in 2010 and new construction work was completed in 2011. This 1830 classic “L” shape brick farmhouse of 5,000 square feet, on 135 acres with an extensive array of grand outbuildings has been restored to original condition. This property is on the National Registry. We were responsible for all of restoration and renovation work to the main house and the two story brick spring house, all work was completed in accordance with the Secretary of the Interior Standards for Rehabilitation. State and federal historic tax credits were issued once the work was complete. All windows, doors and original architectural elements were restored. Systems were updated to include: geothermal heating and cooling, radiant slab heat in the basement, renovated kitchen and new bathrooms. Floors throughout were restored, repaired and refinished with a screening and topcoats of satin polyurethane. All original plaster walls were restored and repaired. All woodwork and plaster walls was primed and painted. A wireless security system was installed. This classic 1781 mill located in Arter’s Mill, Maryland had almost all of the original architectural fabric and mill works intact. Our job was to restore the exterior of the building, repair all of the windows and doors. Restored all window sash, sills and trim. Replace two 6”x8”x50 ft oak sill plates, re-point the foundation and install new metal roofing. Prime and paint entire exterior building. Restoration completed in 2009. This 1860’s Carroll County brick tavern had it’s entire 40’ long x 8’ deep front porch rebuilt to match photographs of the original including new brick patio floor the length of the building. Exterior masonry work throughout the building. Interior plaster work and painting. Restoration completed 2008. This beautiful 8,000 square foot brick building built in 1822 has been an architectural landmark having been used as a boarding house, tavern, and place of worship. This building has a special place in the heart of residents throughout Carroll County. An arson fire in 2000 severely damaged the restaurants’ kitchen and rear porch. Herman Construction was hired through a completive bid process to completely renovate and restore the building for the Carroll County Historical Society for use as museum shops, offices, educational programs, community events and gift shops. The building has also been retro fitted to be fully accessible and meets ADA requirements, and a two-story ADA lift was installed within the original structure. All windows, doors and original architectural elements were restored. Systems were updated to include: geothermal heating and cooling, radiant slab heat in the basement, renovated kitchen and new bathrooms. Floors throughout were restored, repaired and refinished with a screening and topcoats of satin polyurethane. All original plaster walls were restored and repaired. MHT has easements on this building and work was completed in accordance with the Secretary of the Interior Standards for Rehabilitation We finished this project in January 2009. This very handsome 1890 s Victorian building formerly known as the Fat Cat Café, was severely damaged by a fire in Feb 2005. We completely renovated and restored this building back to its former grandeur, including four apartments on the second and third floor and a restaurant / space on the first floor basement area. This historic property known as “Linwood” which is on the National Registry required a variety of restoration repairs including replacement of porch flooring and restoration and replacement of a variety of woodwork including flat sawn balusters and handrails, column, steps, etc. Restoration to numerous outbuildings including a rare two-seater outhouse as well as repairs to cabinet making shop and a stone building with greenhouse. Build new contemporary bank barn with many historic features including: Oak timber framing, stone veneer and fireplace, cedar siding, handmade doors, standing seam metal roof, and skylight. The fusion of historic style and cutting edge technology makes for a wonderful bank barn that features office space, loft, full bath, potting room, and a two bay garage. Interior renovation to a beautifully restored frame farm house previously renovated by famed Washington architect Hugh Jacobson. Second story porch reconstruction and renovation into a glass enclosed office space. This beautifully restored frame farm house was previously renovated by famed Washington architect Hugh Jacobson. Reconstruct historic front porch to match old historic photographs. This ornate and fanciful porch really adds the appropriate dimension this house has been lacking for many years. We used all the finest materials including vertical grain fir flooring, clear fir 1x material, clear cedar posts, and handmade brackets. This porch is supported by brick piers with handmade lattice work between them. This is a major restoration of a historic farm, including a stone manor house and variety unique stone outbuilding and is to be used as a residence for Tom and Lois Frank and their four children. This property is on the Baltimore County Historic Registry. The project scope includes complete interior and exterior renovations, manor house and upgrades to all infrastructure. This design build project includes all architectural work, engineering, and the following repairs: stone foundation, demolish all non historic interior and exterior alterations, repair and replace rotted wooden structural members, install all new plumbing, electric, air-conditioning, basement slabs, insulation and new standing seam lead coated copper roofing, downspouts and gutters. Repair and replacement of windows, doors, repair, plaster work, woodwork, trim, and installation of new heart pine floors and refinishing old floors. The project also included a new 1,000 sq. ft. historically compatible addition. Major structural work includes the complete rebuilding of a 15’ high stone retaining wall at the bank barn and the creation of a 24’ wide opening, supported by two metal “I” beams in the existing outside stone wall of the house, which created a grand entrance to the new addition. Major Restoration of historic stone and log buildings. This project included a new historically compatible addition with terraced stone retaining walls creating a walled-in garden. Complete interior and exterior renovation and repair work to meet the Secretary of the Interior Standards for Historic Buildings in preparation for State Tax credits. This building is on the National Registry. Scope of work included: repair stone foundation, demolish all non historic interior and exterior alterations, repair and replace rotted wooden structural members, install all new: plumbing, electric, geothermal heating and cooling, radiant slab heat, insulation and standing seam metal roofs. Replaced windows, doors, repair plaster work, woodwork, trim, installation of new and refinishing old floors. Harbor House” is a faith based initiative that will provide a 15 bed “safe haven” for Baltimore youths. This is a major restoration of an abandoned and badly deteriorated brick parsonage building. This design build project includes all architectural work, engineering, and the following repairs: interior and exterior renovations and repair work in accordance with local historic regulations, CHAP, COMAR regulations, and Baltimore City. Scope of work included: complete interior demolition, excavate for basement concrete slab floor, sprinkler system, security system, walls, flooring, two sets of spiral stairs leading to sleeping lofts, repair and replace rotted wooden structural members, install all new: plumbing, electric, HVAC, insulation, drywall painting carpeting tile and appliances fixtures. The transformation of a classic Carroll County barn into a residence with a So-ho type loft and Japanese influenced detailing including passive solar and "green" building techniques. We infused the latest modern technology creatively into a marvelously hand-crafted mortise and tenon hand-built barn allowing all of the original structure and its components to stay visible and in use. Restoration of the Benjamin Latrobe Spring House which was moved in 1930 from Roland Park to the Baltimore Museum of Art. Project was overseen by the museum. High degree of restoration to the roofing , flashing, ventilation, stucco, plaster and painting. Provided custom made louvered windows and the shutters were manufactured and installed to match the original and to ventilate the lower level of building. Currently used as an museum exhibit space. Restoration of historic 1850 masonry building into office space and received historic tax credits and an award from Howard County Preservation Award of the Year for 2000. Restoration of an architectural gem to its former glory. It suffered greatly from neglect, exposure to the elements and severe water damage. Intensive restoration included radiant heat installed under the floors and a custom winding staircase to the attic. The unfinished attic was converted into a beautiful suite of rooms. Unusual triple roll siding was duplicated and we had it custom milled. The house was outfitted with all modern conveniences such as heat, air conditioning, wiring and plumbing, without destroying or compromising any of the original details. One of the most challenging projects of my career. The most scary degenerated structure that I have ever walked into. We restored this building to its original grandeur and won an award from the City of Baltimore Preservation Society. Rehabilitation of their nineteenth-century farmhouse in the Maryland village of Sykesville. Wood-framed house comprised three distinct sections: a pre-Revolutionary log cabin, a traditional Georgian center hall house circa 1810, and a Civil War-era ballroom addition. 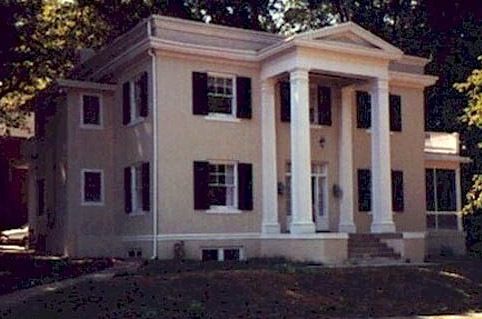 Missing porch columns were rebuilt using original parts found still intact on the property. Wood siding was repaired, rotted siding was replaced, windows were repaired or replaced using old glass, the roof was rebuilt, and the exterior was repainted to match original colors, which were discovered under remaining paint layers.